In the nineties, when I had finished my tour with Milestone Media, and my work on Xero for DC Comics, I got a gig on X-Man…. which lead to lending my talents to the book SLINGERS, a book that used characters that used various aliases that Peter Parker used as a disguise from whatever travails his true alter ego SPIDER-MAN was experiencing. I had done a years worth of that book when I founded that Slingers was to be canceled due to sales and I was brought into the Office of Tom Brevoort who flagged me down after turning in pages. Back then, it was vogue to walk in your work so you could voucher your work for payment. Nowadays, it’s all computers and cloud severs. 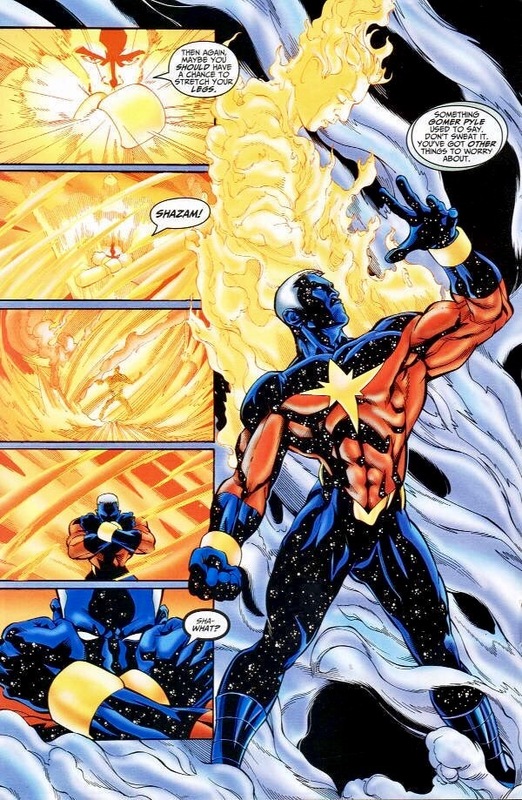 Tom was looking to kickstart a new volume of Captain Marvel, this time using Mar-Vell’s son Genis-Vell along with Rick Jones as his partner in crime. When I learned that Peter David was writing it, I was SO down to draw this book….never mind the mythos behind the Captain Marvel legend. I didn’t even stick around for the end of Slingers. There was a preview script ready for art and I jumped at the chance to do it. So, my first thought was how do I make Rick Jones MINE? I had the idea to make him look like Ricky Martin, who was really big at the time, living La Vida Loca…. and I thought it would be a great update to a legendary character that had been in league with the likes of Hulk and Captain America and had been to war in the Avengers Forever storyline. But I had no pressure in drawing the image that was the new Captain Marvel. And I knew if I did this right, people would start to respect my art abilities. So I used my love of anime and manga storytelling-wise to intro the image of my first time drawing Genis as CAPTAIN MARVEL. I was looking to flex and I saved my excitement for this VERY PAGE. The clanging of the nega-bands by Rick Jones, the POWER COSMIC creating a flash of light, a tornado spiral of energy and air swirling around the now shadowy image of Rick and a pull back in camera to reveal the first image of a cool looking character I would be exponentially maturing my art from for the next three years. All from a straightforward script that gave me the license to truly tell a great story as if I was directing a cartoon. When my best friend found out I was going to draw this particular series for Marvel, he was floored. He loved the Captain Marvel character also. When I think of when my career in comics kicked off, personally feel this page is the seed that got my name perculating in the comics industry. One day I may just redraw this page for fun with the abilities I’ve acquired after over 25 years of drawing comics. Love love love your run on Captain Marvel! I always felt that Peter David has had the best and worst luck with artists. Peter would get a good artist and then they would hit the stratosphere and leave or someone would steal them for another project. Captain Marvel introduced me to your art and I thought what is this? I noticed the anime/ manga influences but to me it had a hint of Graffiti stylized art. How was it working with PAD? It was pretty straightforward, the great thing was there was always room for me to add more in terms of the Art to make the scripts seem more natural. I like room to ad-lib. I think it makes the difference from just drawing what you read to translate words to art, better than just being a structured tight automaton jus doling out pages directly from what he typed. I use that approach to all scripts. I’d let him know what I was up to and he’d jam with it. He’s as talented as you think. Good to read about the genesis if this page and your approach to the project. It was well drawn. Loved loved loved that series! I especially loved your designs for Red Raven and Comet Man, I believed you had a great talent for redesigning costumes and uniforms. I always thought Comet Man should be used more. I was so pissed when Genis was just killed as if nothing in Thunderbolts. I always wondered why you didn’t have more success with either Marvel or DC, wishing you continued success. I’ve been working on my own work for awhile now. I chose to take limited assignments to get my own work up and running complete with a company that will bear my life’s work. God has other plans for me, but I do have things, many things that I will be in control of coming down the pipe. And it will all be revealed on my blog. If you have joined up yet, please do and please share with others. You’ll like what I will have to say in the coming months. And thanks for the wishes!